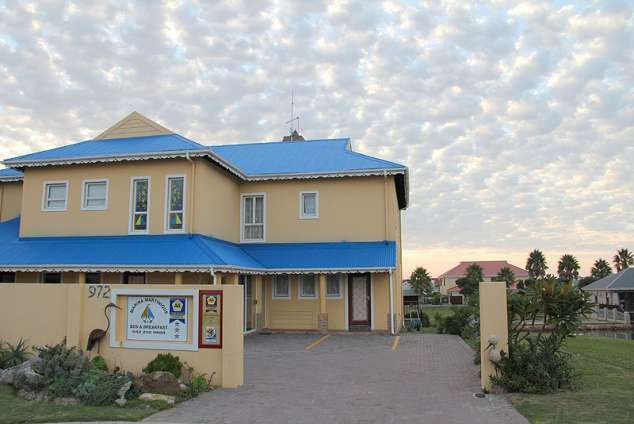 Marina Martinique Bed & Breakfast - Jeffreys Bay Accommodation. The Marina Martinique Bed and Breakfast boasts of five fully serviced, luxurious and spacious, en-suite bedrooms. Each room has a private balcony with views of the canal and the marina. Our rooms are modern chic with marine touches to make each room comfortable and welcoming for our guests. The rooms are equipped with a television with DStv, tea and coffee making facilities, a fridge and a safe for your valuables. There is a comfortable living and dining room that opens onto a large wooden deck overlooking one of the canals. Full English breakfast is served that is included in our rates. Directions to Marina Martinique B&B from PE Airport. When you exit the airport turn left in Allister Miller drive, continue ± 1km to Heugh Rd. Turn left in Heugh Rd till you see the Builders Warehouse on your left ± 7 km– at the robot turn right into 17th Ave that changes into William Moffat. Continue till you get to the N2 slipway to the left towards Humansdorp. Pass the Jeffrey’s Bay East turnoff and take the Jeffrey’s Bay R102 turn-off. Pass 3 traffic circles. Drive for 4.5 km. At stop next to Caltex Garage, turn right into Nautilus road towards Astonbay. Turn left at the T-junction, Koraal street. At the stop turn right towards Aston Bay, pass the circle and turn left into Northern Access Road, continue 1km to Security Gate. Further directions to the B&B can be obtained from the Security. Directions to Marina Martinique B&B from Cape Town. Drive on the N2 pass Humansdorp. Take Jeffreys Bay turn off. On top of bridge turn right. 20351 page views since 04 May, 2007. Last updated on 16 Sep, 2017.